Carrageenan is a common food additive extracted from red seaweed. 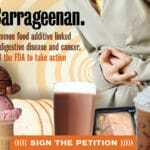 For the past four decades, scientists have warned that the use of carrageenan in food is not safe. Animal studies have repeatedly shown that food-grade carrageenan causes gastrointestinal inflammation and higher rates of intestinal lesions, ulcerations, and even malignant tumors. Despite the evidence showing the risks in eating carrageenan, it’s still approved for use in organic food where it’s most often used as a stabilizer. It’s an ingredient in many dairy products including ice cream, cheese, yogurt , sour cream, whipping cream and chocolate milk. You’ll also find it in nondairy milks including soy, almond, coconut and rice milk. Processed lunchmeats like chicken and turkey can contain carrageenan, and it’s often also found in canned soups, frozen dinners and frozen pizzas. 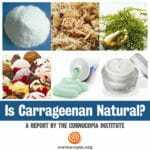 Where is carrageenan not found? Well, first off, it’s not in most minimally processed foods. 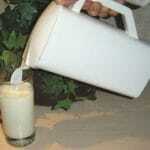 So if you can make something yourself, you greatly reduce your risk of exposure to carrageenan. Still, be on the look out for seemingly simple ingredients such as milk, sour cream or yogurt. The USDA organic seal is not protection from carrageenan. Shocked to find that so many organic foods contained carrageenan, we did a lot of digging to identify products and brands that avoid it. 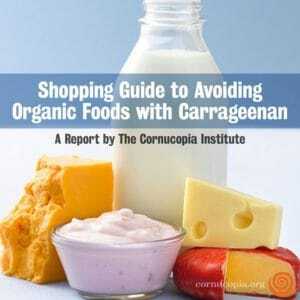 We put together a comprehensive shopping guide that gives you a detailed look at the organic products that contain carrageenan and those alternatives that do not. For example, if you’re looking at organic chocolate milk options for your children (who can be particularly sensitive to carrageenan), you’ll want to avoid brands including Horizon, Kirkland, Natural by Nature, Organic Valley (1% and 2% shelf stable varieties), and Publix’s brand. Instead, brands with carrageenan-free options include Castle Rock Organic Farms, Equal Exchange Hot Chocolate (powder), Organic Valley 2% (refrigerated), Strafford Organic Creamery and Thomas Organic Creamery. Organic yogurt is a popular category these days, but you’ll want to skip Trader Joe’s, Horizon, Publix, and Stonyfield’s Oikos caramel flavor and all Squeezers. Instead, opt for carrageenan-free organic brands such as Nancy’s, Organic Valley (pourable), Redwood Hill Farms, Seven Stars and Strauss Family Creamery. Ice cream should be a treat to eat, not a digestive nightmare. So check your labels twice if you’re purchasing organic ice cream from Julie’s (Mocha Java flavor only), Organic Meadow or Trader Joe’s. Instead, enjoy Green and Black’s Organics, Publix, Stonyfield, Strauss Family Creamery, Alden’s and Three Twins. Buyer beware! If you’re choosing nondairy milks due to allergy or sensitivities to dairy, you may be jeopardizing your digestive health if carrageenan is among the ingredients. And there’s a good chance that’s the case if you’re buying Almond Breeze, Almond Dream, Pacific Foods or Trader Joe’s almond milk. Pick up 365 Whole Foods brand, Silk PureAlmond, Westsoy or Trader Joe’s refrigerated brand. Coconut milk options that contain carrageenan include Coconut Dream, Lakewood (juice), So Delicious and Trader Joe’s original, vanilla and light. Substitute those with Blue Monkey coconut water, Knudsen’s coconut nectar, Thai Kitchen or Native Forest. The list of soymilks that contain carrageenan is so long we’ll just skip to some of the brands without it: Edensoy, Organic Valley, Soy Dream’s classic vanilla and enriched chocolate, Trader Joe’s unsweetened and Westsoy original, unsweetened and low fat. If you’re looking to avoid this toxic food additive, we know how you feel. And the options can be overwhelming! But we’ve made it easy to navigate the supermarket. Check out our complete Shopping Guide to Avoid Organic Foods with Carrageenan, and read our full report, “Carrageenan: How a Natural Food Additive is Making Us Sick” here.